Online and big data have created opportunities that were unthinkable just few years ago. Physical businesses remained far behind and just recently started to catch-up. Providing free WiFi access to visitors, tracking pedestrian flows or building and sophisticated personalized customer experiences all fit within the same underlying long term trend: digitization of physical places. Originally an academic spin-off from Milan Polytechnic, Mobimesh has chosen to develop a proprietary Marketing and Analytics Big data platform to ensure full control of the underlying technology and superior service to its customers. Integrated Guest WiFi, Marketing and Location Analytics in a single platform. Mobimesh One Platform® is open, scalable, and easy to use by design. 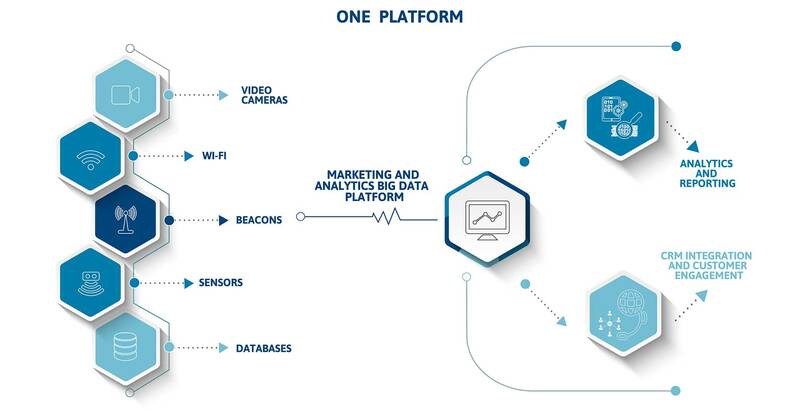 Mobimesh One Platform® can seamlessly integrate videocameras, WiFi access points, beacons, IoT sensors and third party databases. Large amount of data can be processed in real time to provide rich analytics and business intelligence reports to monitor what happens in stores, malls, airports, railway stations and many other physical contexts. Social log-ins and welcome back mechanisms allow for frictionless guest WiFi experience and customer profiling. CRM integration and contextual advertising are the basis of the most effective marketing campaigns.